In this series I have been looking at what the Gospels say about the mother of Jesus. I have argued that on the basis of these scriptures alone Christians of all traditions have an explicit warrant, if not a mandate, to give great honour and praise to Mary. 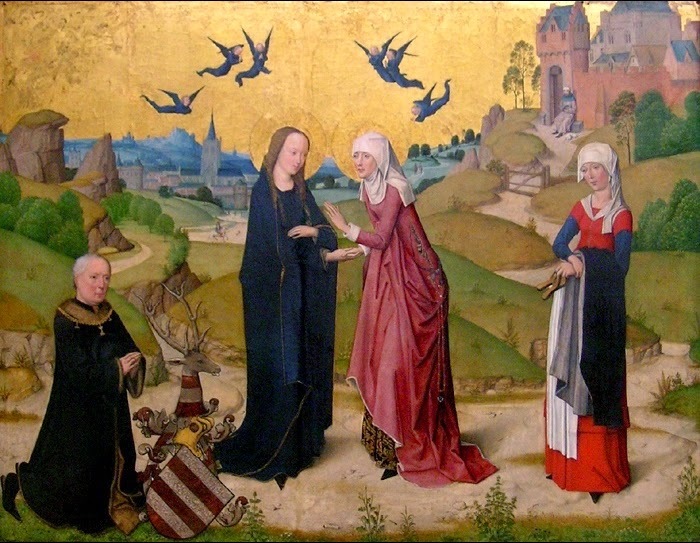 In this conclusion to the series I propose to look at references to our Lady in other parts of the New Testament and to demonstrate the cumulative effect of the undisputed biblical references to the Virgin. The "all these" referred to are the Apostles. This passage is significant for many reasons. It tells us that Mary was a woman of prayer. It tells us that she formed part of the core group of believers gathered together in Jerusalem at the beginning of the life of the Christian Church. And once again, as I have highlighted in the previous parts of this series, it shows that the mere presence of Mary is something that the Holy Spirit wishes to draw out attention to. This verse is situated between the Ascension of Jesus and the descent of the Holy Spirit at Pentecost. The probability is that Mary was present at both occasions but we cannot be certain of this. However, so far as Pentecost goes St Luke writes When the day of Pentecost had come, they were all together in one place (Acts 2:1 NRSV) The "they" in this case referring to all the believers, about 120 in all, which certainly included Mary. 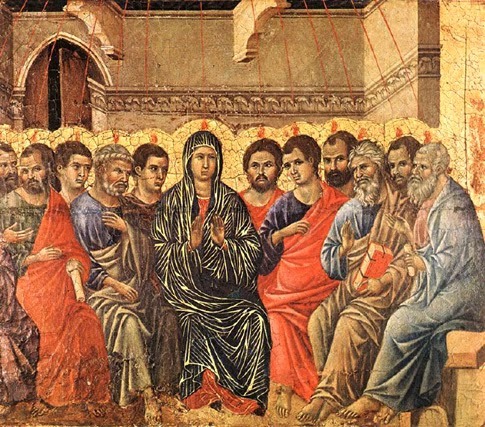 Pentecost marks the birth of the Church as the body of Christ and the presence of the mother of the head of the body at this event clearly is no accident but a deliberate act of Divine Providence. -The Archangel Gabriel tells Mary that she has "found favour with God"
-Mary is the first person in the world to hear about Jesus. -Immediately she becomes the first person to have faith in Him, i.e. Mary is the first Christian. -She is (necessarily) present at the Incarnation of the Son of God which takes place in her womb. -The sound of the Virgin's voice is the agency which God uses to cause St John the Baptist (and St Elizabeth) to be filled with the Holy Spirit. -The divinely inspired St Elizabeth declares our Lady to be Blessed among women. -Mary treasures and ponders all these events in her heart. -Mary was present when Jesus was offered, in accordance with the Law, as a symbolic sacrifice to the Father in the Temple. -The Virgin was the subject of a prophecy by the inspired Simeon which specifically refers to her and to the closeness she will have to the sufferings of her Son. -Jesus, Mary and Joseph become political refugees seeking asylum in Egypt in order to save the life of the Saviour. -Mary's suffering for three days while Jesus is missing, hidden in the House of His Father, prefigures the events of the Passion. -Mary displays a delicate and charitable sensibility by being distressed at the potential humiliation of the newlyweds at Cana. -Prompted by this she prays to Jesus and by her prayers brings about the first public miracle of Jesus' mission. -Mary accompanies Jesus from Cana to Capernaum where our Lord begins His public mission of preaching, teaching and healing. -Mary accompanies Jesus to the Cross and stands steadfastly at its foot sharing in His agony. -Jesus, in the final depths of that agony, takes thought for His mother and gives her into the care of His beloved disciple and gives the beloved disciple into her care. Until He had done this, St John suggests, His mission was incomplete. -Having been present at the birth of her Son in the flesh at the first Christmas Mary was also present in the birth, as it were, of her Son in the Spirit as the the Body of Christ appears in the world at Pentecost. Taking all of these things into consideration a Christian would have to be hard hearted indeed not to frequently offer up thanks to God for the gift He gave us in Mary. And if that is not enough one other consideration should be borne in mind, Jesus Himself undoubtedly loved His mother and what is good enough for Him is surely good enough for us. One of the title which Catholics give to Mary "Mother of God" often causes Christians from the Reformation traditions (also called Protestants) to wince. They seem to think that it was a title invented with no other purpose than to elevate Mary into a position for which there is no scriptural warrant. This stems, I think, from a misunderstanding. The title was agreed at a council of the then undivided Christian Church at Ephesus in the 5th Century in order to defend against an heresy which attacked the divinity of Jesus. In its original Greek it is Theotokos which can also be translated as 'God bearer' or 'birth-giver of God.' The point about the title is that it primarily tells us something about Jesus, that from the moment of His conception we was both fully God and fully human, and only secondarily something about our Lady, that she was the mother of the Incarnated second Person of the Trinity. What it does not do is suggest that the second Person of the Trinity had no existence until He appeared within Mary's womb. 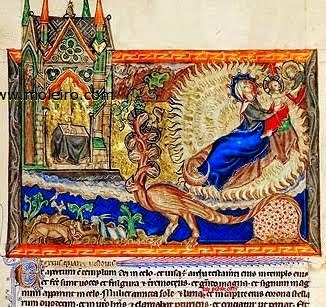 I am always slightly puzzled by Protestant objections to the use of "Mother of God" since they are willing enough to acknowledge that St Elizabeth was perfectly correct to call her "the mother of my Lord" (Luke 1:43 NRSV) and that it is quite orthodox to refer to Mary as the mother of the Son of God. It is almost as if the idea of conceding anything to Mary is some sort of surrender to Rome. This text, sadly, does not come under the heading of undisputed references to Mary. While Catholics certainly accept it to be such most Protestants prefer to see in it a reference to Israel or the Church. It is not my purpose in this series to enter into such matters of controversy so I will not insist upon this interpretation but I will make a couple of points in regard to it. Firstly, it is in the nature of divinely inspired Scripture that it contains multiple levels of meaning not all of which are instantly understandable at first reading. This means that for some texts at least we are not faced with the choice 'either it means this or it means that' but can instead say that 'it means both this and that.' Catholics take the view that this is one such scriptural passage arguing that it certainly does refer to the Church/Israel as well as Mary the mother of God. Protestants do not have to accept this interpretation but I would argue that they should at least acknowledge that it is a plausible understanding of it. Which leads on to- Secondly, Reformation tradition Christians react with something akin to horror to the title of 'Queen of Heaven' being applied to Mary. Yet, if this scripture can reasonably be understood to refer to her then a woman in the heavens possessed of a crown can equally reasonable be understood to be a Queen and her realm clearly is heavenly. As an aside, a further reason for such strong reactions to the title lies in the previous use of it in reference to a pagan deity Ishtar. It seems specious to me, however, to argue that because pagans used a title therefore it becomes forever barred for use by Christians. The pagan king Nebuchadnezzar, for example, is referred to in Daniel (2:37 KJV) as King of Kings yet this does not prevent the same title being applied to our Saviour Jesus. Similarly the pagan god (or gods) Baal are frequently referenced in the Bible but the word itself simply means 'Lord' and if we disallow pagan title in Christian usage then it would be a sin to say that Jesus is Lord which is manifest nonsense. In conclusion I would simply say this, Christians of all traditions have in the Scriptures a common treasure and treasury. Part of that common heritage is Mary, the mother of Jesus. By honouring her we do not dishonour Him in any way but by ignoring her we do dishonour Scripture and the clear purpose of the Holy Spirit. Follow @stevhep on Twitter Google+ and Tumblr, follow Catholic Scot on Pinterest. Thoughtful, logical and soulful explanation of who Mary is to Catholics... and why we honor her, not worship her in the way we worship the Lord. Thank you for putting together all those examples and explaining so clearly!